John Morris Scientific offers the Syro Wave automated peptide synthesizer developed by Biotage. Biotage, a leading supplier of tools, technology and instrumentation for medicinal and analytical chemistry announced a new initiative to develop new applications for Biotage Syro Wave in the field of synthetic peptide and protein chemistry. Global demand from research scientists for synthetic peptides continues to grow at a double digit rate. Their needs are for increasingly longer and more complex peptides to study protein interactions, produce peptide antibodies and understand complex disease states. As the number and complexity of peptides increase, the scientists and researchers need new tools that offer higher productivity and increased performance. 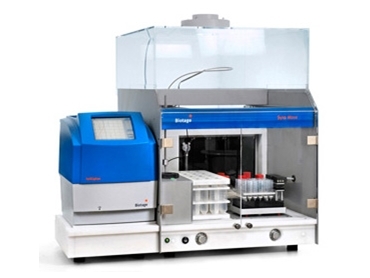 The Biotage Syro Wave automated peptide synthesizer was jointly developed by Biotage and MultiSynTech GmbH. Syro Wave automated peptide synthesizer combines the proven technologies behind Biotage’s Initiator microwave instrument with the well-established Syro line of robotic peptide synthesizers from MultiSynTech. “The Syro Wave is the first valve-free peptide synthesizer with integrated microwave heating. It holds great promise for the synthesis of both long peptides and even small proteins,” noted Professor Knud J. Jensen from the Faculty of Life Sciences, University of Copenhagen.